Have you tried the new Starbucks Discoveries beverages? Starbucks is offering a new way for you to enjoy a Vanilla Latte, Caffe Mocha, or iced Caramel Macchiato. In your grocery store, in cartons, is a new product called Starbucks Discoveries. I had some difficulty finding it initially – notice that in my photo, I found it in the section with orange juice, and lemonade. 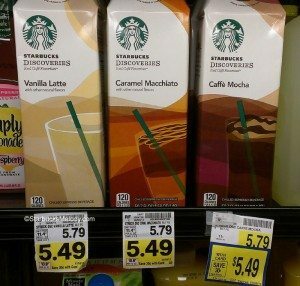 When I saw the cartons of new Starbucks Discoveries, I thought maybe it was the same item as an internationally popular Starbucks drink called Discoveries. (I still don’t know if it is the same item). In any case, I had high hopes for this new beverage. I bought a carton of the Vanilla Latte and Mocha, and figured that was a fair starting place to try these. I would love to know what you think of the Discoveries. It does have a coffee-esque flavor, but I thought it had a strange aftertaste, the Mocha version more so than Vanilla Latte. I want badly to give these two thumbs up, but I am afraid I can’t do that. I tried the Vanilla Latte more than once, and poured over ice, and it’s a little better over ice. Of course, taste is pretty subjective so I am hoping someone in the comments will disagree with me and love this new product. I didn’t really like the aftertaste. I don’t think it tastes close to a true espresso flavor. It’s a mediocre substitute for a real Vanilla Latte or Mocha. The Starbucks website has official nutrition information for the Discoveries. By the way, while I was at the grocery store, I did find more of the Strawberry Lemonade Via which is delicious. If you haven’t had the chance to pick some up, and you’re looking for a refreshing summer Via, this is a good one! I still think it might be the best of the Refreshers Vias. Have you tried the Starbucks Discoveries? Starbucks buys Evolution Fresh – Melody reviews some of the new ‘coming soon’ juice offerings. NEW: Starbucks bottled Iced Coffee: now at your grocery store. In the news: Starbucks teams up with Dannon to launch new Evolution Fresh branded yogurt. Teavana Unsweetened Black Tea – Bottled and ready-to-drink! I bought one today, just to try. After getting home I noticed it didn’t have a recipe, nor a website to find recipes, so I had to just make up my own. I absolutely loved it! Serve over ice add whip cream and cinnamon if you like. I’m officially obsessed. I did not notice an aftertaste.